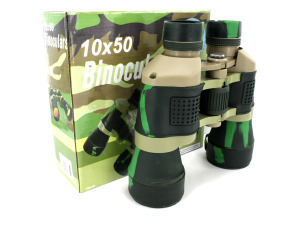 These camouflage binoculars come with a soft nylon pouch, compass and lens covers. Has a powerful focus range of 8m/988000m. Good for watching nature, landscapes and sporting events. Quality at a great price. Item comes in an individual box with UPC. Dimensions are 7 1/16" x 7 1/8" (at its widest) x 2 1/4".